Are you ready for more serious connection, accountability, and ACTION? The Create If Community Membership is made for YOU! You will be invited to our private membership community (on Facebook) with office hours, monthly hot seat group coaching calls, and more. It is more personalized attention and accountability. I give my personal time and attention to this group FIRST. I share the inside of my business even more than I do on the podcast and in the free community. What I learn, I pass on to you. Directly. No fluff. No filter. PLUS you'll have access to the Foundation Series course AND the exclusive content library (a $200 value), which continues to grow as I create new videos and trainings. Right now there are over 20 videos, including how to set up and run webinars, how to create online courses, and what you need to know about selling to your email list. Plus exclusive interviews! Are you ready to move forward? 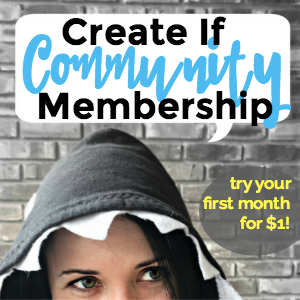 Join the Create If Community today for just $1 your first month. I know you'll want to stay. And at $17/month, it's a an investment that you can make even if you are JUST starting out. Start out with a $1 trial! After your first month, the payments will increase to $17/month. If you are unhappy, you can cancel payment at any time! Save $25 by choosing annual payments!